superdumb supervillain: Celebrate Cinco de Mayo with a Piñata Attack! Celebrate Cinco de Mayo with a Piñata Attack! Move beyond La Bamba at your Cinco de Mayo fiesta this year. Lucky Diaz and the Family Jam Band (Latin Grammy winners and Emmy Award nominees!) 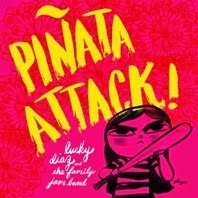 will have you shaking a tailfeather with their brand-new surf rock anthem Piñata Attack. It's the first release from their upcoming bilingual album, Adelante, due out this summer. Until it arrives, check out their back catalog and super fun iPad apps.